HR professionals know the struggle all too well of having to do tedious tasks nearly every day. Luckily, solutions have come along to automate much of this work and have already lessened the burden on many HR departments. 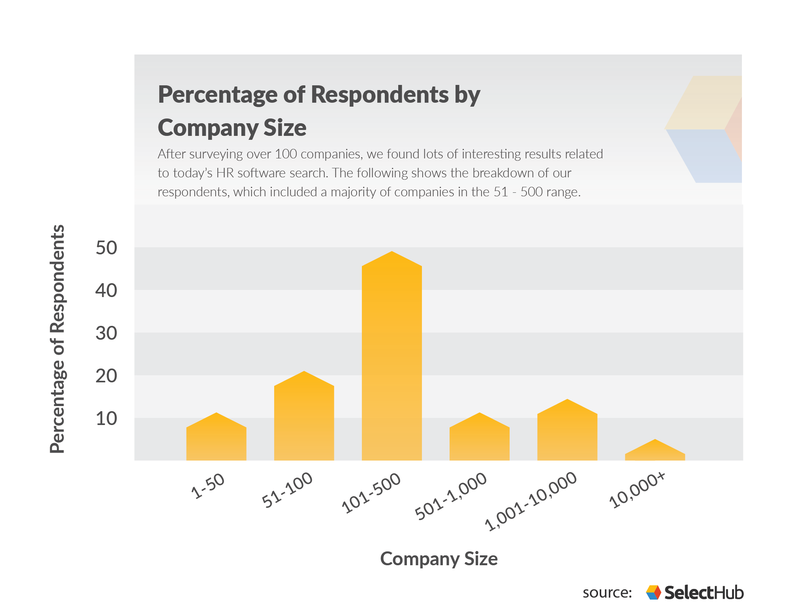 Today, the HR software market finds itself among the leaders in business software. With a marketplace worth over $14 billion and rising, HR management software has become one of the most important tools for companies to implement. First up, we wanted to identify what technology buyers were looking for in today’s HR software market. Unlike what we found in our marketing automation study, there was a lot of consensus among the responses. Over half of HR respondents were able to identify six of the same requirements, while only 48 percent of marketing automation buyers could do the same. This led us to conclude that the needs of HR professionals are more universal than those in marketing. After all, a good marketing strategy should be catered specifically to the company’s business model and goals. HR processes are pretty much the opposite. Functions like payroll management and benefits administration, for example, don’t have much room (or need) for variety. The trend we saw from the responses is that the most common requirements involve features that automate frequent, time-consuming tasks. Similarly to buyers of marketing automation, the biggest requirement for HR technology buyers involved the cloud. However, while 48 percent of marketing automation buyers were open to a cloud solution, a whopping 100 percent of HR buyers were open to the cloud. This also included 61 percent of respondents who identified a preference for a cloud solution. While we knew cloud-based products are often preferred, the unanimous acceptance of the cloud was a little unexpected. But it only provides more evidence that cloud-based software is here to stay. After the cloud, the most sought-after requirements were two Core HR features. 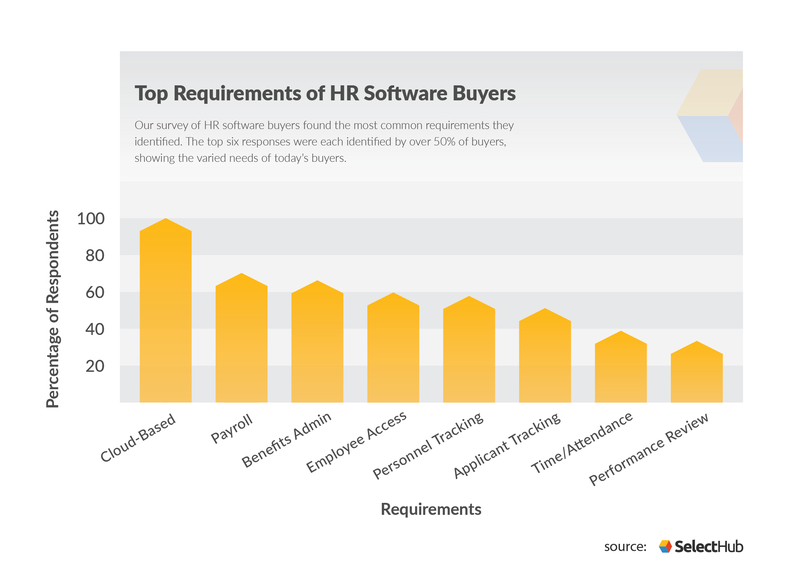 Payroll, at 69 percent, and benefits administration, at 63 percent, were the two most desired features of HR software. Payroll alone is lengthy and laborious work but benefits administration can be just as time-consuming and complicated. These facets are only magnified in larger companies with even more employees to repeat these processes for. It’s no wonder that HR managers are looking to automation, as these tasks pull great deals of time and attention away from the more human aspects of the job. At 60 percent, employee access was the fourth-most common requirement. Buyers were especially interested in employee self-service capabilities from their HR solution. A portal available for all company employees was the most commonly mentioned form of employee access. In fifth and sixth place were more Core HR features, with personnel tracking coming in with 58 percent and applicant tracking systems (ATS) rounding out the top six with 51 percent. Other notable requirements were time/attendance (39 percent), performance review and management (33 percent) and learning management (LMS) (32 percent). So what do HR buyers see as their biggest hurdles in making a decision? Believe it or not, there was even more consensus in this category than for requirements. A lack of time to make a decision was the most common challenge identified, with 85 percent of respondents mentioning it as a consideration. We defined the challenge of time-sensitivity as wanting to choose and/or deploy a new vendor within six months. To understand why time is so important to human resources you have to consider the scope of an HR department. HR is the only team in your company that concerns itself with every position. If HR functions are inefficient, it can slow down processes for job seekers, new hires and, of course, existing employees. It’s crucial to fix inefficiencies quickly so buyers can prevent negative employee experiences from becoming commonplace. Not too far behind time was budget considerations, which 60 percent of respondents identified. This one doesn’t take a rocket scientist: no company wants to shell out half of their revenue for software, no matter how important. And honestly, we thought this percentage would be higher, similar to time-sensitivity. So to our surprise, the remaining 40 percent of respondents were open to hearing the full range of prices for new vendors. Get our HR Software Comparison Matrix. 33 percent of all respondents identified finding an all-in-one solution as a challenge, making it the third most common. These buyers were concerned with finding a vendor that would offer all the HR resources they needed. There are several vendors that specialize in one feature or another but not as many that are all-encompassing. Other challenges respondents mentioned were scalability (6 percent) and ease of use (3 percent). 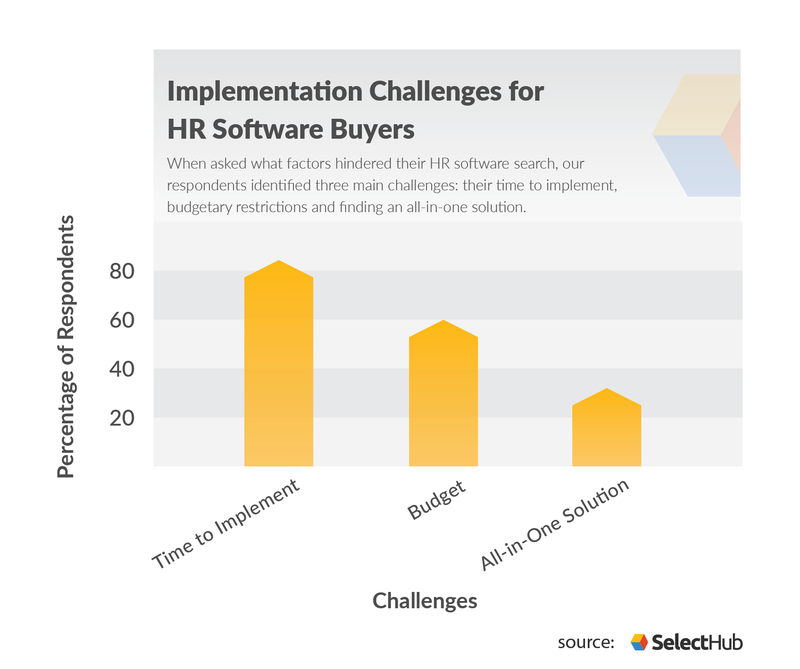 At this point, you’re probably wondering why all of these HR software buyers were looking elsewhere. What had their current vendors failed to do? For 50 percent of respondents, a lack of features was the reason they were in the market for a new HR system. Systems that were “too manual” were at the center of the second-most popular complaint with 25 percent of respondents. Lastly, the lack of centralization in the HR system ranked as the third biggest vendor failure, with 21 percent of the responses. A system that’s not centralized refers to HR solutions that don’t offer all critical features in a single location. We think this is probably related to the challenge mentioned earlier of finding an all-in-one solution. There were several buyers concerned with finding an all-in-one solution in part because their current vendor isn’t one. One thing’s for sure: human resources will never be the same. Core HR features consolidated into one platform has become a necessity for businesses. As a result, it’s become a necessity for vendors to offer it. These vendors are also going to need to tack on some additional features to become true all-in-one solutions. Additionally, all of those features are going to have to be available on the cloud, lest they risk losing relevance and popularity. And based on the overwhelming acceptance of the cloud among HR leaders, they may already be irrelevant if they’re not cloud-based. For buyers that, like many of our respondents, are concerned about the time they have to choose a vendor, take a look at our HR Leaderboard. Our Leaderboard can help get your search started before diving blindly into demos and conference calls. If you still need help evaluating your options, don’t hesitate to reach out and we’ll help you find the right HR vendor for your needs.